My family has this on the Christmas table every year, for the best part of 15 years now, maybe more. We missed a couple of years to try something different, the classic straight forward one with cloves or the coca cola glazed ham, but we always, always come back to this beauty. 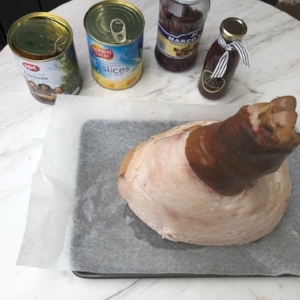 It's all about tradition at Christmas time and this fruit glazed ham is our family tradition and hopefully it might start as yours. Get you finger in between the skin and the fat, then slowly peel back the skin. Get a piece of baking paper 20cm long and wrap it around the shank bone, tie up with twine ready for the bake. Use toothpicks to secure pineapple. Evenly distribute pineapple but use most of the pineapple at the 'Front' of the ham. Just using 2 or 3 pieces for around the side of ham. See picture C.
Then place apricot and cherry in the centre of the pineapples pieces. Should only take 10 minutes to secure all the fruit. Lay ham down (pic B) so it fits in your oven. You will have left over fruit but we will add these to the baking dish in the last 20-30 minutes of baking. Bake for 80 minutes, in that time you will need to bast with ham syrup (approximately 6 times) and the excess syrup that is at the bottom of the baking dish with a brush. Make sure you bast all the fruit so they don't burn and 'slow and steady wins the race' with this one. The last 20-30 minutes add the left over fruit and coat them with juices at the bottom of tray. Take out and get the platter ready with napkin/cloth for dressing. Wrap the bone around with linen cloth and secure with Christmas ribbon. Then stick rosemary sprigs under ribbon so they hold. See below pic. Add the fruit on the platter or a separate bowl and pour juices from baking dish all over the ham. I hope you enjoy our family Fruit Glaze Ham as much as we do and have a very Merry Christmas from our kitchen to yours.